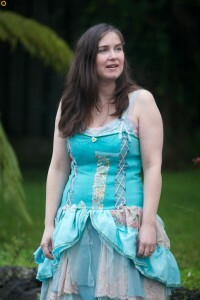 Thanks to my husband Keith, I got some lovely shots of the finished fairy style dresses I made. This one I am wearing is the one I wrote about in my last post , made from denim scrap from some jeans and other bits and pieces. It took me a long time to finish, as I got quite frustrated with the whole thing a few times, then it finally came together the way I wanted. The skirt is made up of different layers using strips of tricot and tulle on the bottom, some tea dyed broderie anglaise cotton from an old skirt, strips of vintage spotted net and some ripped up pieces of an old blouse, and then the patchwork bustle layer on top. The bodice is cut from the bottom half of a pair of jeans (the top got made into a skirt) with patchy bits here and there, and mock lace-up inserts on the front. I have more close-up pics of the details in my last post, and of the bodice and construction of the first layer here. Coming soon, pictures of the other dress. Oh this is lovely, so pretty! 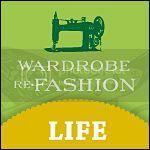 Thanks for sharing on Recycled Fashion Finds!